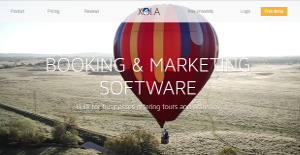 Xola is a booking and marketing software for tourist companies. It provides them a complete software suite with all the tools required to book tours and activities and manage their business. It is focused on improving productivity and increasing revenue. It is an enterprise like solution designed to give tour operators the ease to manage everything from one place and on the go. From booking online to paying online, everything is managed digitally to reduce costs. With tools like scheduling, questionnaires and coupons, such business can improve their services significantly. Not only does it help with management, it also takes care of all your marketing needs. It will ensure that your customers keep coming back to you and that you gain many more new ones. The biggest benefit of this software is that the productivity of your business would increase exponentially. For instance, online booking of a tour would take less than 30 seconds. Faster bookings mean more sales and more sales means more profits. And since it is mobile ready, it has all the more potential as so many customers now purchase using their mobile devices. Xola provides high quality services that are aimed at improving the overall structure and management of your business. For this, you have unlimited training, data migration, and upgrades. The help is just a phone call away any time of the day. You can accept any kind of payment which provides you and your customers a lot of flexibility and convenience. Modifying a booking is an easy process as well. Similarly, the scheduling tool is an all-rounder as it helps you manage tours and optimize times. With questionnaires tool, you can ask customized questions to get necessary information before the tour. This is very important as it allows you to take a customer-centric approach which in turn benefits your credibility and popularity. With these, you can also get email addresses of your customers and use it for marketing. Speaking of marketing, this software solution has also got your back for promoting your business. You can create coupon codes and customize their validity for a season, days or even hours of a day. The reports tell you how successful your campaigns were. Last but not the least, the pricing model has so many options and you get to choose the program that best suits your needs. And if you cannot find something for your business, you can custom design the solution and get pricing for that. If you are interested in Xola it may also be beneficial to investigate other subcategories of Best Online Booking Software gathered in our database of B2B software reviews. It is important to realize that almost no software in the Online Booking Software category is going to be an ideal solution that can meet all the goals of different company types, sizes and industries. It may be a good idea to read a few Xola reviews first as some solutions may excel only in a very narrow group of applications or be designed with a very specific industry in mind. Others might work with an intention of being easy and intuitive and as a result lack advanced elements needed by more experienced users. There are also solutions that support a wide group of customers and offer a powerful feature set, but that frequently comes at a higher price of such a solution. Make sure you're aware of your requirements so that you buy a solution that has specifically the functionalities you look for. How Much Does Xola Cost? We realize that when you make a decision to buy Online Booking Software it’s important not only to see how experts evaluate it in their reviews, but also to find out if the real people and companies that buy it are actually satisfied with the product. That’s why we’ve created our behavior-based Customer Satisfaction Algorithm™ that gathers customer reviews, comments and Xola reviews across a wide range of social media sites. The data is then presented in an easy to digest form showing how many people had positive and negative experience with Xola. With that information at hand you should be equipped to make an informed buying decision that you won’t regret. What are Xola pricing details? What integrations are available for Xola? If you need more information about Xola or you simply have a question let us know what you need and we’ll forward your request directly to the vendor.